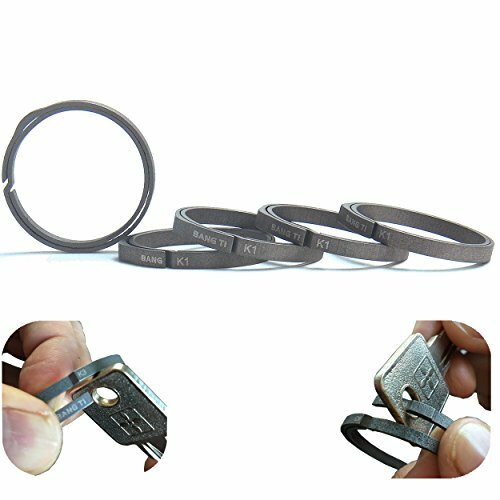 BANG TI Titanium Nail-Saving Flexible Small Keyring (K1, 26mm/1.02", 5-pack) | What Should I Say? Errr, you must be bored using the traditional key rings to waste your finger nails and time! BANG TI K Series (K1, K2, K3) keyrings only does the same job as any other key rings, but they makes it much easier to add or remove keys. Suitable thickness, Just push the 1st layer to side easily and put on the key. But please note that you must keep the two layers non overlap when use. * Never facing the Keys fell off and got lost easily again. * Never have to take off a large bunch of keys to just open a specific door. * Group your keys to be easier found. * More easy and convenient to release your car key to the parking valet. * Reduce your key bunch weight, yes, lighter than steel, less weight, higher quality with titanium! With BANG TI retail box, considerate gift choice! Trying to Make Perfection More Perfect. Mainly focus on producing titanium products, outdoor multifunction tools and sports equipment. Always insisting strict quality control and keeping testing, improving, to ensure BANG TI can always be your trustworthy exquisite life supplier. We also accept wholesale and custom producing. >> DURABLE AND FLEXIBLE, made of titanium, anti corrosion, lightweight, handy, and definitely cool! >> WORRY-FREE SECURE, effective to organize/group your house keys, car key, work keys, EDC tools etc. >> Unlike carabiners? They are also quick to release just the keys you need. The special way to operate your keyrings also makes it a little more fun. >> (k1, 0.94" small size) Please note: you must keep the 2 layers non overlap when use. Making life easier and higher quality and more fun with BANG TI. If you have any questions about this product by BANG TI, contact us by completing and submitting the form below. If you are looking for a specif part number, please include it with your message.